Pinkz Passion : September - A Herald of Festivity! September - A Herald of Festivity! As we step forward to September, it’s hard to believe that we are about to kiss goodbye to summer and welcome fall. As the beach vacations, road trips and cottage staying will fade in distance, life will be trapped back into a busy cycle by hitting the hay early. However, the tan on our skin and the memories we created this summer are adequately evident that we enjoyed summer to the fullest. Ignoring the look of displeasure we are also ready to pack the bag and send our older teenager for her university life again. We will miss her presence (which is loudly felt in the home) and her infectious smile which is unfazed. With September we also march into festivities and our home is so ready for a grand affair with celebrations galore. 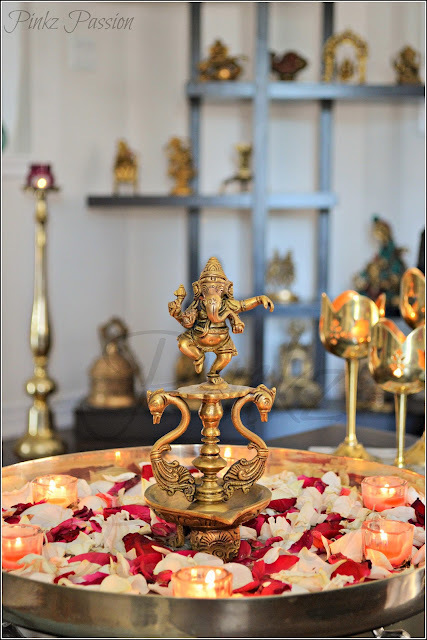 We are all set to make Ganpati Bappa’s grand presence felt in our home. 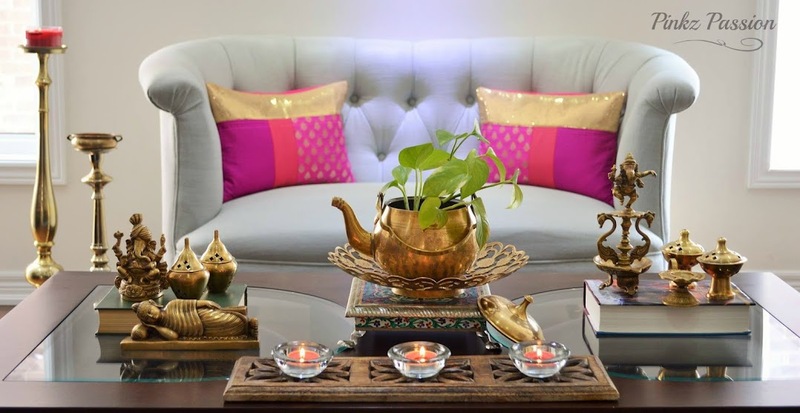 Hope the coffee table arrangement here will exude the same vibe for you all :). On top of my saccharine and syrupy stories of our "Gifted Ganesha" collection on the blog, this month first time ever we are also taking a different turn by hosting a wonderful ‘Giveaway’ in collaboration with our featured product segment. Further down the road, this month we also have a home tour which will leave a compelling impression on all the décor lovers. And our every year’s ritual has been followed this year as well. 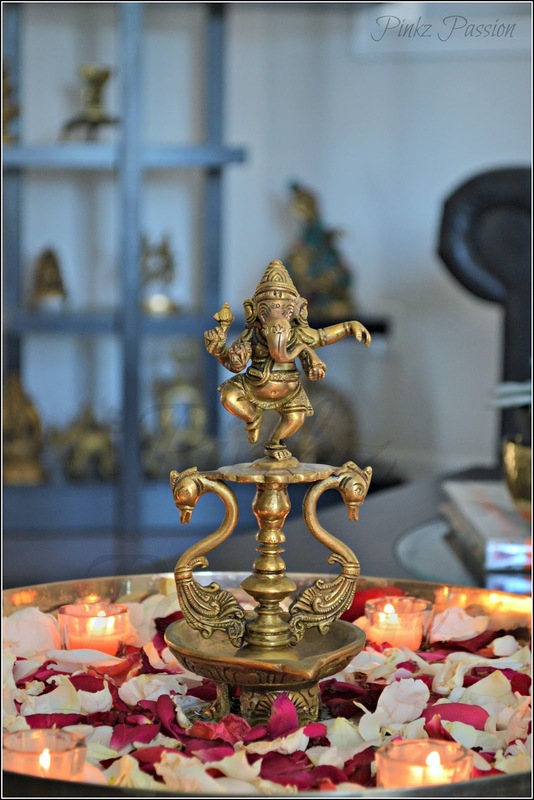 Our young lady in the house has created another eco-friendly Ganesha for this year’s celebrations. I will be unfolding the new 'avatar' of him on the blog tomorrow. Until then signing out hoping that my enthusiasm has rubbed off on you to bring on the festive mode. Make sure to keep yourself connected on Facebook and Instagram for more big and small decorating ideas, toodles! 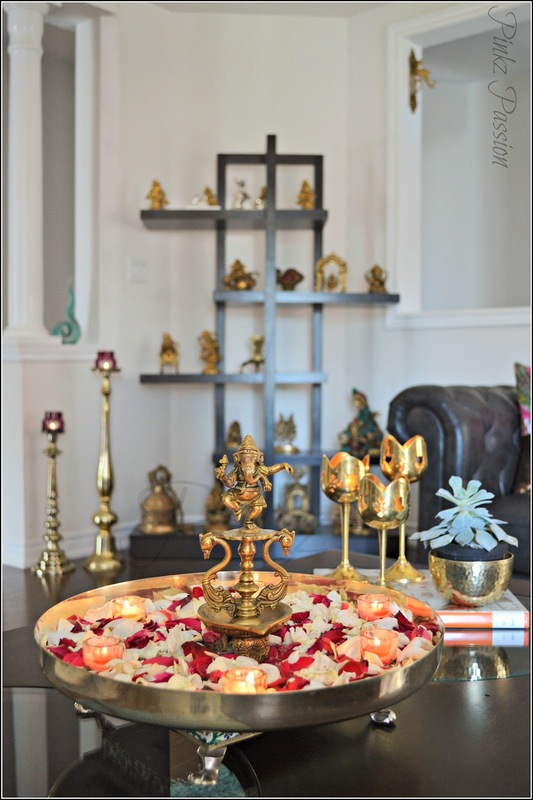 I love the shelf/curio you have with the beautiful and serene display of Ganeshas you have in the living room. Would you please share where you got it from and what is it called please. As always thank you for sharing with us. Thank you Rani, the curio is from one of the local furniture store called 'Bricks'. It was a love at first sight for me also. You may also search under book cases to stumble upon such pieces. The Indian Weave Giveaway Winner! If you enjoyed the post, consider leaving a comment or subscribe via email to have future articles delivered to your inbox. All the images are taken by me, please do not copy or share without prior written permission. Images are the property of Pinkz Passion and are subject to copyright. Please do not copy images without permission. . Awesome Inc. theme. Powered by Blogger.